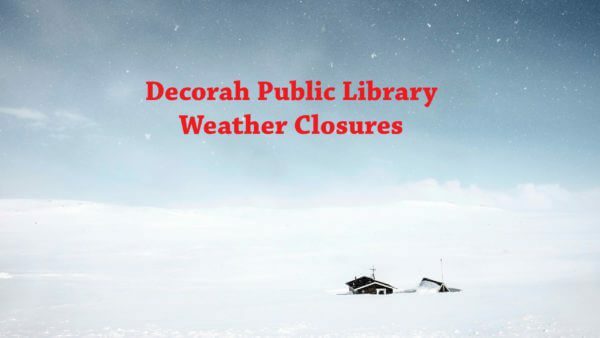 The Decorah Public Library will close at 5:30 pm on Tuesday Jan 29 and will be closed all day on Wednesday January 30 due to inclement weather. Library staff anticipate opening as usual from 10 a.m. to 8 p.m. on Thurs Jan 31. The Drug Trends program with the Decorah Police Department originally slated for Tues Jan 29 has been rescheduled for 6:30 p.m. Tuesday Feb. 5. As always, the public is encouraged to call 382-3717 or check the library’s website or Facebook page for up-to-date information regarding program cancellations or postponements.